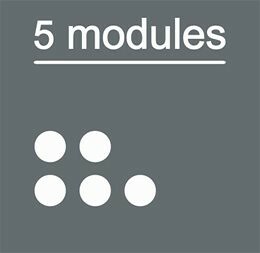 I’ve always like that the 5 Modules project had a built in limit of five releases. The first four were released in 2007 and the final installment came out in July this year. This disc, 5 Modules V, differs from the previous four in that that it is made up of three composed pieces, one each from Ryu Hankil, Hong Chulki and Choi Joonyong. The pieces each use a simple score and tend toward a combination of improvisation, simple structure and process. The basic structure inherently uncatchable, combined with such repurposed technologies as clocks, turntables and CD players give these pieces an incredible strong sense of failed modernity. The subverted mechanics evokes the dissolution of the industrial age and the whole endeavor has always seemed to come across as music made in the ruins of civilization. It seems a fitting conclusion to a series that has always flirted with chaos, disorder, subversion of simple tools and expectations. The first track, musicboxxx, composed by Choi Joonyong, is a loping set of repeated sounds; multiple simple rhythms with slight variations that run for the tracks duration. The score is simply that each player is to take their assigned instrument and to follow a specific instruction operating on a single axis, in this case it is the speed of rotation. Choi Joonyong, for instance uses a cd player in this piece and his instructions were to “change it from slow to fast and vice versa“. Hong Chulki’s was instructed to operate his turntable in the opposite fashion: “change it from fast to slow and vice versa” while Ryu Hankil’s clocks were to be left alone(2). With these clocks running as a damaged metronome the rotating sounds limped along, sometimes fast, sometimes slower until after a predefined ten minutes they drop out in short succession. It is the interlocking and variably rhythmic nature of this piece that I think makes it so interesting. The use of rhythmic elements is both rare and rarely done well in these abstract musics and this piece I think both manages to pull it off and rather subvert the notion of rhythm at the same time. The rhythms only really exist on one level, that is to say in the sound elements that each musician utilizes. Structurally the variation in the rhythms between the multiple sound sources do not ground the piece in a common rhythmic structure or fit together in a polyrythmic type of scheme. No the rhythms here only exist on the surface level and ultimately they actually are just a feature of the sounds and are not a structural element. pieces, by Ryu Hankil is a fairly precise set of instructions for the three players which are to be repeated three times. These three “movements” are clearly defined by a one minute silence between each one. The sounds are described as being “vibration sounds” and they do seem to capture that in this realization. Rattles, non-linear rhythms, short bits of feedback and the like are the tools chosen for this piece. This piece is interesting in that it uses precise timings, but the nature of the events are fairly vague. For instance one rule reads “after 1 minute playing, change second vibration sound and playing 1 minute“(2). So you play your first selected sound for a minute and then change to your second sound and play it for a minute. Of course these sounds are only defined as “vibration sounds” which is certainly something to try to evoke but at the same time gives you a lot of flexibily. For each of the three movements the players are supposed to change the order of the three sounds that they have chosen. This piece actually reminds me of the “internal scores ” that I have worked on, by with the precise element of the stopwatch. It’s clearly defined movements and alterations in the presentation of the sounds, combined with the natural variations in the performance of the sounds makes for engaging listening. One aspect I quite enjoy is how the timing is not quite identical for each player and their is a tapering off at the end of each movement. If this was what I call an “internal score” (see this post) then there would be no stopwatch involved (beyond the ultimate duration) and that sort of effect would be heightened. This I think would be an interesting variation on the piece. Hong Chulki’s, feedback ring for three electric players, is the most clearly defined process piece in that it’s score is basically a flowchart of how the instrumentation is to be set up. The feedback ring is the three musicians instruments setup to feed into each other in an infinite loop. 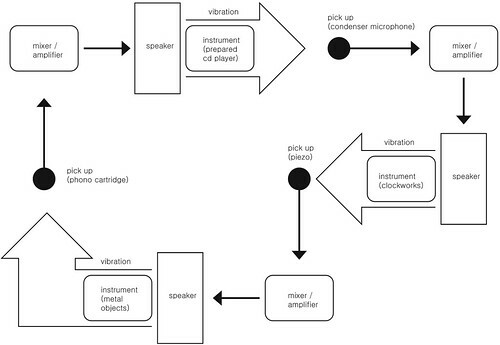 Within this setup one presumes that the instruments are left to respond as they will to the input that they receive, which results in an ever shifting, multi-layered tones of feedback with the background rattles, buzzes and hums from the constituent parts. It isn’t specified but one does also assume that there is some intervention from the musicians, if not in directly playing their instruments, then in adjusting the mixers so that this doesn’t just spiral into a massive wall of distortion and feedback. This is pretty clear from the constant build up and backing off of the screeches of feedback, that combine to form the non-linear structure of this piece. I find the layered sounds in this piece fascinating and the details amidst the moments of chaos highly engaging. I also think that the combination of process and control is an interesting one: it isn’t simply wound up and left to play out on it’s own, it requires human intervention and thus becomes a more rewarding experience. One could imagine a purely technological solution, threshold devices that can keep the volumes and intensities within preset limits and that might present interesting, albeit different, results. But this simple setup and basic human intervention is I think a fantastic thing in and of itself. This foray into composed music is really one after my own heart. They work with improvisation as an element and setup formal systems as a set of constraints. This to me is an area that is rife with possibilities, an edge zone where the most dynamic and unexpected results lurk. Taking simple concepts, and applying them to the detritus of modern society that these three use for their instruments is incredibly successful, they are constantly flirting on the edge of incoherence but the structuring elements keeping it hovering in vital territory. The music from these three and their fellow musicians in Korea has been amongst the most vibrant and dynamic and this is I think the strongest statement to date from them. I’ve been fascinated with the music from the scene for several years now and it continues to be an area I’ll watch with rapt attention.